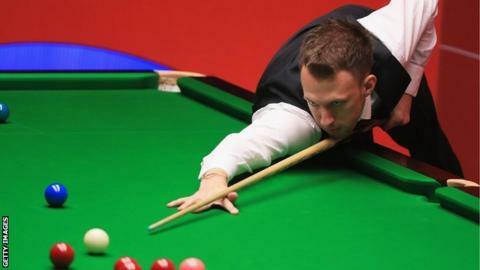 Judd Trump admitted he was "relieved" after scraping through the first round of the World Championship in Sheffield. The world number eight led qualifier Tom Ford 6-2 overnight, but lost the first three frames without potting a ball before eventually winning 10-8. "In the last frame, I potted a good yellow and green to win, but other than that I didn't do a lot right in the whole game," Trump, 24, told BBC Sport. Northern Ireland's Mark Allen and Hong Kong potter Marco Fu also won. Fifteenth seed Allen beat Michael Holt 10-4 and now looks set for a meeting in round two with the 2010 world champion Neil Robertson, who led Robbie Williams 7-2 overnight. Australian Robertson is seeded to meet five-time champion Ronnie O'Sullivan in the final should they both progress. His first-round match continues to a finish on Thursday evening. Fu saw off Martin Gould 10-7 to set up a meeting with 2005 champion Shaun Murphy, while Welshman Dominic Dale built a 7-2 advantage over the 13th seed, England's Mark Davis. Trump, the 2011 runner-up and 2013 semi-finalist from Bristol, struggled for form even when he was on top, and became increasingly frustrated as the game wore on. "It's just a relief," he said. "The less I can say about it the better." "I just got really bored and started to take everything on. If I had carried on playing how I was, then he would have won. At 8-8, he had quite a few chances and when I got in I didn't feel comfortable at all." But Trump said he would not worry about his form on his fifth Crucible appearance, as long as he keeps on winning. "It doesn't matter how you play," he insisted. "If you become world champion, then you become world champion and that is what you need to remember. The thing for me is not to get too disheartened."